Some stories have 'national press' written all over them. This was one of them - and it fell right in my lap. It's not often that a story of national significance occurs about 10 metres away from your desk. It all started a little over a month ago when an anonymous letter was delivered to our newspaper office. 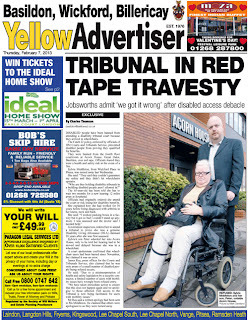 It claimed that a local disability tribunal service, which operates out of the same building as our newspaper, was turning away people in wheelchairs. It was an interesting accusation but one which would be difficult to prove. We kept the letter on the back burner. In the UK, when a disability impedes a person's ability to work, they qualify for Disability Living Allowance - cash from government to help them get by. If the government suspects that person might not need that allowance after all, it orders them to appear in a tribunal court and prove they are genuinely disabled. But this tribunal service was preventing disabled people from proving they were genuinely disabled... because they were genuinely disabled. The anonymous letter was followed by an anonymous phone call. Then people in the building began gossiping about it. It wasn't long before my colleague Paul, who uses a wheelchair, found himself stopped in our building's reception by a security guard who told him that wheelchairs were no longer allowed upstairs in the building. Paul has worked for the newspaper for 11 years. Fortunately, a word with our boss saw him allowed back upstairs again. Some tribunal attendees weren't so lucky. About three weeks ago our receptionist telephoned up to the office and told us that a person in a wheelchair was being turned away as she spoke. I rushed downstairs with my notepad and caught 65-year-old Sylvia Middleton just as she was exiting the building. Sylvia came back into reception where I interviewed her about what had happened. She told me she had worked for 30 years of her life, beginning at age 15, but had then been struck by serious arthritis in her knees, back and neck. She was assessed and told she could no longer work, so she qualified for Disability Living Allowance. In late 2011, the government decided it no longer believed Sylvia Middleton could not work. She would have to prove in a court that she was genuinely disabled, or else her money would be stopped. She arrived at the Basildon tribunal office ready to prove that she was genuinely afflicted. Only she wasn't allowed... because she was genuinely afflicted. Security told her she was a hazard in the event of a fire and that her tribunal had been moved back by two months to a new court more than 10 miles away. We snapped a picture of Sylvia and her son as they left the court, disappointed by the fresh delay; they'd already waited over a year for a resolution to their situation. 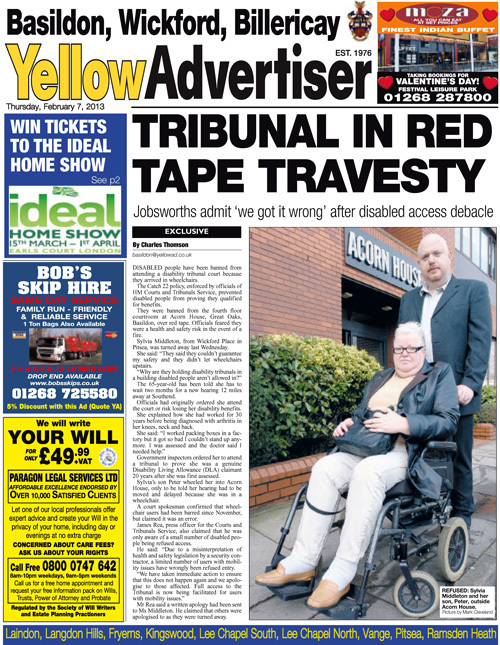 I had an immediate inkling that this story would make waves; the irony was almost too perfect; disabled people prevented from proving they were disabled because they were disabled. We contacted HM Courts and Tribunals Service, who admitted to us that the problem has been ongoing for three months and blamed it on security workers, claiming they had misinterpreted health and safety laws. The story got better and better; steeped in irony and a 'health and safety gone mad' angle. We ran it as our front page scoop. If that print is too small to read, click here for the online version. My nose for a national news item proved right; the story was picked up by the Daily Star, the Daily Mail and the BBC, attracting the ire of campaign groups along the way. Whether all the media attention will help Sylvia Middleton's cause, I don't know. I'd like to think so. But at the very least, it prompted the tribunal service to mend its ways ; as far as we're aware, wheelchair users are now allowed upstairs again.